June 8, 2010, 5 p.m.
By Megan Garber @megangarber June 8, 2010, 5 p.m.
With the cutback of political reporters at every major newspaper in the state, the need for more political coverage is clear, we will have a new Governor come November, and the citizens of Minnesota need to know as much as they can about everyone in the race. This means we need more, more stories written, more video captured and more questions asked. We’ve decided that our communities who rely on our coverage may also share these goals and we are excited to be using Spot.us to help us crowd-fund this story idea. 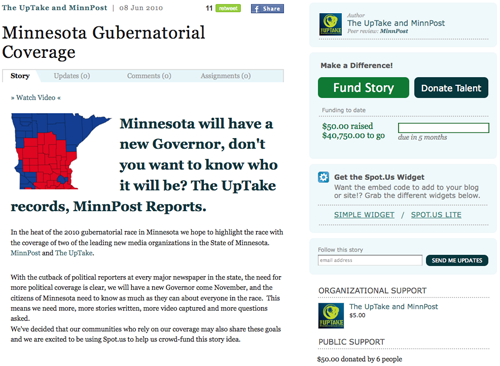 The pitch comes from the Minnesota nonprofits MinnPost and the citizen journalism site The UpTake. It’s looking for funding through November. Oh, and it estimates the total cost of the project to be $40,800. Yes. That’s steep by all accounts — “if I’m realistic, I don’t know if we’re going to hit that,” Spot.us founder Dave Cohn told me — but it’s also based on straightforward estimates of the man-hours both outlets will require to report (MinnPost) and record (The UpTake) information between now and election time this fall — with about a 50/50 split between the two. MinnPost, says Roger Buoen, the managing editor overseeing the site’s coverage, will have a lead journalist backed with, if resources allow, three or four other reporters. And The UpTake, executive director Jason Barnett told me, will hire a professional videographer — again, if resources allow — to be assisted by the outlet’s cadre of citizen volunteers. That’s a commitment. And a costly one. Indeed, the collaborative coverage idea “has been one of the most expensive projects presented to Spot.us,” Barnett notes. This isn’t the first time media organizations have used the Spot.us platform to solicit donations for reporting — in the past, the community-funding site has hosted pitches from Bay Area news organizations like the Oakland Tribune, San Francisco magazine, the San Francisco Appeal, the Bay Guardian, and Investigate West — but the MinnPost/UpTake partnership represents a significant step forward for the still-fledgling site. Not only are the organizations based in Minnesota — and proposing to produce an ongoing series of stories that are very specific to Minnesota’s interests — but they’re also, together, significantly bigger than most other outlets that have solicited funding through Spot.us. The trifecta came about as many such collaborations do: through a casual meeting that became something more. Cohn and Barnett met each other “maybe a year and a half ago,” Cohn recalls, “and we always talked about doing something together.” At the same time, Barnett and his staff had been working with MinnPost, supplying livestreamed video for, among other things, the long saga that was the Al Franken/Norm Coleman Senate recount. The collaboration — MinnPost supplying the reporting, TheUpTake providing the video — worked so well that they wanted to continue it for other political stories. “Jason and I had been talking for some time about gubernatorial coverage,” Buoen says; the Spot.us pitch was in some ways a logical outcome of that discussion. So a Kickstarter-esque, all-or-nothing proposition this is not. “Even if we don’t raise a lot of money, we’re going to do a lot of this stuff anyway,” Buoen says. The question is how much reporting they’ll be able to do with whatever funds they’re able to raise. Cohn said that, for Spot.us pitches that don’t reach their fundraising goal, reporters have the option to take the money donated and do the work anyway. And Buoen sees the Spot.us effort as existing separately from MinnPost’s current, three-tiered revenue stream of reader donations, advertising dollars, and foundation support. POSTED June 8, 2010, 5 p.m.